Agrimony describes 12 species that fall under the genus Agrimonia. The medium-sized flowering plant is native to the Northern Hemisphere and can be found in various parts of Europe and North America. Regardless of species, agrimony are beautiful, if not, somewhat striking with their bright, beautiful yellow flowers which grow from a single spike. The plant is relatively small but draws attention due to its unique beauty and aromatic scent which is reminiscent of an apricot. 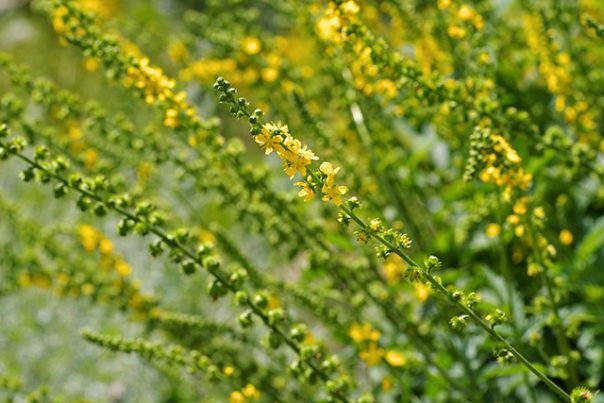 Agrimony is primarily used to stop bleeding and promote healing. This made it a very useful herb during medieval warfare. In fact, modern healing items used to staunch bleeding are made with extracts of agrimony. This fantastic property means that the herb can be used to stem heavy menstrual bleeding. Practically all parts of the plant can be used, although most healers prefer to use only the stem. Quite interestingly, agrimony was once used in folklore. White witches believed that agrimony helped ward off hexes and provide protection against goblins, evil spirits, and poisoning. Those who followed the voodoo practice also used agrimony as an effective block against curses. Today, wiccans place the leaves of the plant in their pillowcases to guarantee a good night’s sleep. Agrimony is best known as an emmanogue. The plant can effectively stop excessive bleeding while preventing the wound from being infected. It can also be used to prevent pimples, blotches, and the like. The tannin content in the plant can help alleviate symptoms of coughs and sore throat. Agrimony thus presents itself as a great anti-inflammatory agent as well as an astringent and tonic. Supposedly, agrimony can even be used to heal peptic ulcers although there are few studies to conclude this. Even so, traditional healers say that agrimony can improve digestive health. Agrimony is a potent diuretic. This means that it aids the kidneys and bladder to flush out excess toxins and get rid of kidney stones. The same flushing qualities imply that agrimony supports the cardiovascular system as well. Most importantly, however, is agrimony’s effect on the skin. Its silica content halts bleeding and can be used to treat a variety of scrofulous sores and skin conditions. How you use agrimony will depend on what you’re using it for. If you intend it to use it for its emmenagogue properties, it is best to make a decoction made from equal parts of dried herb and warm water. The healing effects of the bath are amplified the longer the herb is allowed to steep. Gently wash the bleeding area with the decoction while simultaneously drinking around two to three cups per day. If you only wish to improve your general well-being, agrimony can be made into a tea. You can use any part of the plant, although most of the nutrients are found in the stem. Simply steep the plant in water. Take note though that more tannins are released the longer the plant is in water. While this proves useful as an external bath, too much tannin can cause gastrointestinal issues. Agrimony is a great herb to use to stop bleeding and prevent infection. The herb can also be used to improve digestive health.